Social media is the biggest tool designed for people who interact with each other and share their ideas, information, and content. At first, the idea was to connect people and help individuals to keep in touch with their friends and family. Today we are witnesses to a constant expansion of the World Wide Web. The importance of social media has also gotten bigger over the years, changing the world as we know it forever. Since the business market is growing every day, this was a new communication method to reach out to customers. 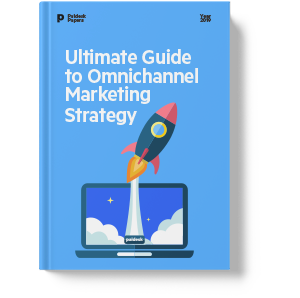 It became an indispensable tool for finding customers, sales, advertising, and promotion. But most, it’s a tool for career opportunities. Social media’s role is significant because it facilitates communication with customers. It enables the melding of social interactions on e-commerce sites. Ability to collect information helps market researchers in promoting products and services. It enables the distribution of focused, timely and exclusive sales and coupons to would-be customers. And it can assist in relationship building, through loyalty programs or affiliate programs linked to social media. It is the biggest resource for both small and big businesses that are looking to promote their brands on the Internet. The important thing for businesses is to figure out what is the most popular social media site. Both for their brand and audience, they are trying to reach. All platforms are easy to use. Some of them even have options for paid advertising for businesses that want to reach a new audience. 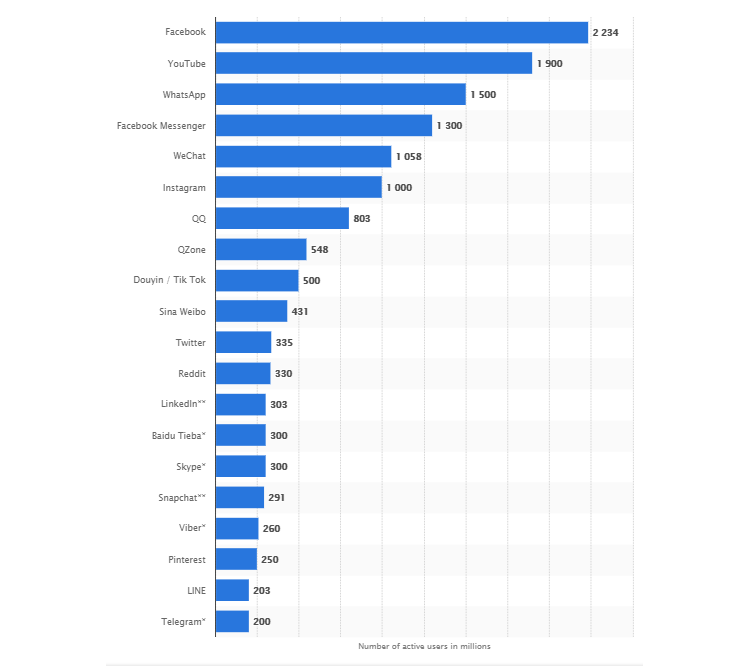 This picture shows information on the most popular social media worldwide as of October 2018, ranked by the number of active accounts. Facebook is the number one market leader and the first social network to surpass 1 billion registered accounts. It currently sits at 2.23 billion monthly active users. So, why do brands go social? Because it’s where their users hang out. It is a way to promote brands and products online and through other digital channels. 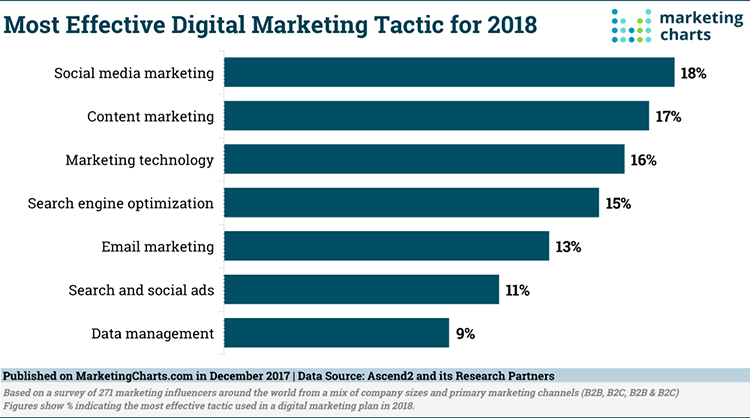 Marketers are using lots of different digital technologies to target their audience. This includes various display ads, emails, mobile technology, PPC and social media. It is all used to engage and attract their target customers, collect valid leads in real time. Online Marketing: It includes communication options such as websites, search ads, display ads or banner ads, email ads. Social Media Marketing: It advertises products or services through forums, blogs and social networking sites such as Facebook. Mobile Marketing: It t uses text messages, mobile applications and ads to build traffic. Forget about browsing at a physical store location and asking sales associates for more information. Today, consumers are using the internet to gather lots of information they need to know before they make purchasing decision. That’s where digital marketing comes in. It helps your business reach consumers wherever they are. Almost every business has their own target audience they are trying to reach. Digital marketing is helping them to find that consumers they want through the internet and other digital avenues. That’s why it’s is key to modern business strategies. The internet plays a significant role in how today’s consumer makes purchase decisions. The internet also impacts how consumers actually buy their products and services. This makes it imperative for businesses to not only be present online but to boost visibility as much as possible. Most important for business owners is to understand how digital marketing works. Then they can use the right digital tools and campaign tactics to reach and engage their audience. We are aware that businesses can use various techniques to promote themselves and also their brands. Because of that, there are numbers of different roles ranging from assistant to executive which helps in achieving goals. The list goes on and the roles are available in different seniority as said. This provides immense room for growth and progression in your career. Getting involved in Social Media is not doing Digital Marketing as many people think. There are much more elements that make up a Digital Marketing campaign. Social media is the biggest part of Internet Marketing which is part of Digital marketing. While it refers to specific websites, it can be one of the many mediums that are being used in digital marketing campaigns. Digital marketing has lot more in its domain including digital materials and the act of marketing ourselves online. It’s a major thing to learn the difference between these two so you can use the appropriate tools in your campaigns. Today, both social media and digital marketing are key components for your business and for your brand. We can see that digital marketing is the future of marketing and for sure it will gain more and more ground in the online and offline world. Social media is still trying to hold its major component which is a connection with other people. Since it’s part of digital marketing for sure it’s here to change the way we find new customers and promote our products.